Yes, Virginia, there is a Day of the Dead Santa Claus! Who better to deliver gifts to all the Muertos we remember? 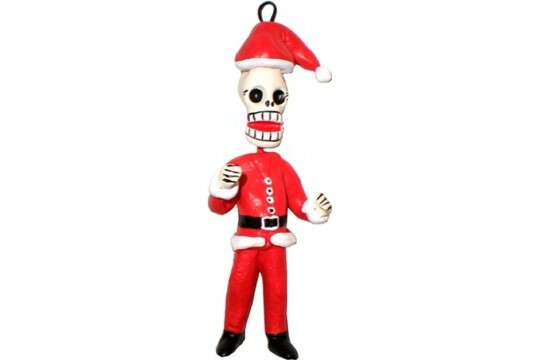 Dressed in his finest suit of red with fluffy white trim, our Day of the Dead Santa Claus will make a welcome addition to your holiday décor! He has a hanging loop atop his cap and he measures about 4-1/2 inches tall. He is definitely meant for hanging as he cannot stand alone. Our Santa Claus ornaments are so finely detailed down to the buttons on his bright red jacket and individually painted fingers. 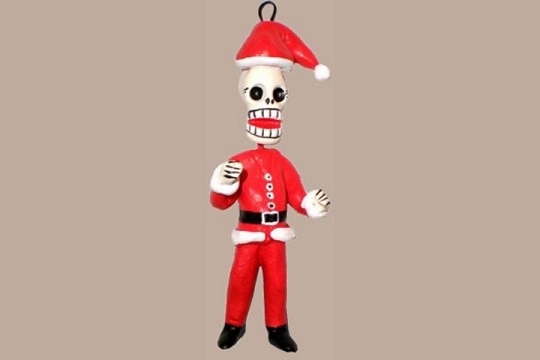 Our Santa is quite slim, as are most skeletons! Just like the rest of our Day of the Dead Figurines, each of these Santa Muertos is hand sculpted and painted by traditional artisans in Mexico. Please let us choose one for you.